Usage is billed in 15 minute increments, and there is a 30 minute minimum charge for all appointments. Cancellations/Missed Appointments– Users who have scheduled time may cancel up to 24 hours in advance of their start time. If users do not show up for a scheduled appointment, or cancel within 24 hours of the appointment, they will be billed for the scheduled amount of time. Training – All new users will participate in one or more training sessions with Service Center staff. New users within an experienced lab may be instructed by trained personnel in the lab, but prior to being able to run samples by themselves, they will also be required to participate in a training session with Service Center staff. After hours / Weekend Use – The Service Center is open Monday – Friday, from 8am – 5pm. Trained users may be allowed access to the facility after hours and on weekends, after they have been given approval from the Service Center Manager. Please inform Manager of any plans to work outside of normal lab hours. Radioactive Materials – Radiolabeled samples are not permitted in the Service Center. Acknowledgements – Please acknowledge the Flow Cytometry Service Center in any grant application or publication in which equipment and/or staff expertise was provided. Also, please send the Service Center manager a copy of accepted publications containing data generated in the facility. Biosafety – In an effort to decrease possible infection risk to Service Center staff and lab users, we require that all samples be fixed prior to analysis. We are aware that certain applications preclude the fixing of samples. Should there be experimental reasons that your protocol is not compatible with fixation, please discuss this with Service Center staff before running samples so appropriate handling and containment can be implemented. The Flow Cytometry Service Center is equipped with two FACSCaliburs. Both have two lasers (488 and 635nm), and are capable of detecting FSC, SSC and 4 colors. Both instruments operate under CellQuest Pro software. BD FACS Array This is a Dual-Laser cytometer, with 532 and 635nm excitation, designed for screening applications, using cellular or bead-based assays. It is capable of four color analysis operating under FCAP and BD FACSArray System Software in a 96-well format. 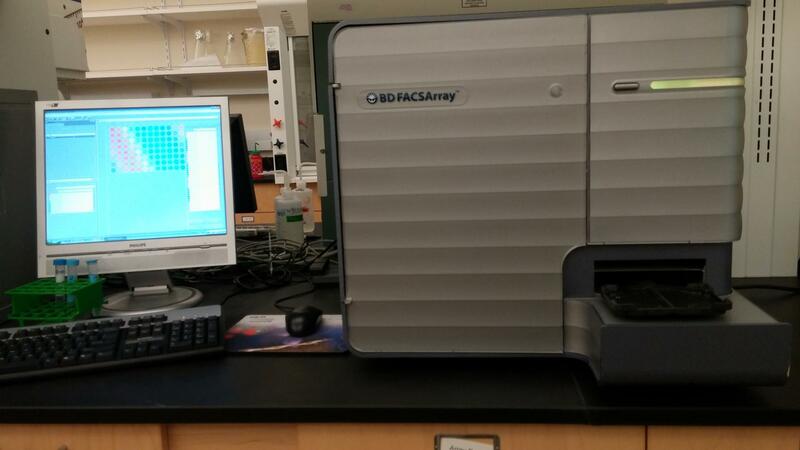 Our DxP10 is a BD FACSort that has been upgraded to a Four-laser cytometer (407, 488, 561, and 637nm). It is capable of detecting FSC, SSC and 10-colors. It operates under FlowJo CE. The Service Center’s Aria is a four-laser platform (405, 488, 561 and 642nm) instrument capable of detecting FSC, SSC and 17-colors. It is the Center’s only instrument capable of sorting samples. It is able to sort up to four separate populations from the same sample, at a rate of up to 30,000 events/second. It is stationed in a Baker BioPROTECT biosafety cabinet. It operates under BD FACSDiva Software. Check the calendar below and then submit a request to use an instrument. If you are having issues viewing this calendar, simply try to refresh the page. If the issue persists, you may need to try another browser. Please note: Users will be billed for the amount of time they have reserved. If users arrive late, the billing time will start at the beginning of the scheduled appointment. The mission of the Facility Advisory Group is to provide guidance and feedback to the facility regarding the most effective use of its resources to meet research demands. Rodrigo Franco Cruz , Ph.D.
Purdue Cytometry Discussion List – Ongoing discussion platform related to a multitude of flow cytometry topics. Fluorofinder – Experiment Design & Reagent Search Platform – After selecting “Build a Panel,” search for “University of Nebraska Lincoln (UNL)” in order to use settings specific to the Service Center’s instruments. Thermofisher Panel Builder - Tool designed by Thermofisher for designing multi-parameter flow cytometry panels. The Daily Dongle – Archive of FlowJo related webinars and discussions. FlowJo YouTube Channel – Indepth video tutorials covering a wide range of FlowJo topics. Flow Cytometry – A Basic Introduction by DeNovo Software – A useful introductory book discussing the basics of flow cytometry. Optimized Multicolor Immunofluorescence Panels (OMIPs) – Peer-reviewed articles describing optimized multicolor panels. These are great resources to utilize when building new panels, as they show what antibodies and fluorochromes work well together for specific cell types. Practical Flow Cytometry – By Howard Shapiro – This free download of the 4th edition of this text offers very detailed discussions related to hardware, software, and applications. The Flow Cytometry Service Center is a part of the Center for Biotechnology at the University of Nebraska – Lincoln. The Center provides users with instrumentation, support and technical service for cell sorting and analysis. The Center currently manages and maintains four analysis instruments for use, including two 2-laser/4-color BD FACS Caliburs (488 and 635nm), a 2-laser/4-color BD FACS Array (532 and 635nm), a 4-laser/10-color Cytek DxP10 (407, 488, 561, and 637nm). The cell sorter is a 4-laser/16-color BD FACS Aria II (405, 488, 561, 642nm) that is housed in a Baker BioProtect biosafefy cabinet making it possible to sort BSL2 samples. The Aria II is capable of sorting up to four populations at once at a rate of up to 30,000 events/second, and is equipped with an automatic arm to be used for sorting in multi-well plates or slides. The Center’s Manger, Dirk Anderson, over thirteen years of flow cytometry experience, in both academia and industry. Along with analysis and sorting, the Center also offers training, protocol development assistance, and data analysis. This grant program is aimed at encouraging new users to employ NU core facilities in their research. The program is open to all faculty from any of the NU campuses. Awards are intended to be used to gather new or additional data for strengthening a grant proposal (new or resubmission) or for addressing reviewer concerns associated with a peer-reviewed manuscript. Click here for more details.